- What is a PivotTable? Why use them? This course is for the expert user who has good experience with Microsoft Excel or has completed the five courses in our Beginner Series plus Expert Level 1, 2, 3, 4, 5 and 6 classes. This course will teach you how to work with PivotTables and PivotCharts in Excel. We will begin by learning about PivotTables, what they are, why they're useful, and what you can do with them. Next you'll build your first PivotTable. We'll start with a list of sales data that looks like this (don't worry, you can download the sample data sheet from my web site instead of having to type it all in). You'll then turn it into a PivotTable report that shows a breakdown of each store (city) for each year, along with totals for each. This demonstrates the power of a PivotTable. You'll learn how to set row and column labels, assign your data values, and change the total function from COUNT to SUM, AVERAGE, MAX, and several others. In the next lesson, we'll learn how to edit the PivotTable. You'll learn how to change the data fields in the PivotTable, set multiple fields per axis, expand and collapse levels, and filter & sort your data. You'll learn the difference between label filters, value filters, and report filters. You'll see what o "pivoting" your data means. Next we'll learn about various PivotTable options. You'll learn how to work with multiple sets of values, change the PivotTable Pane Layout options, and defer the layout update. You'll explore several of the PivotTable Options, including setting a value for empty cells. 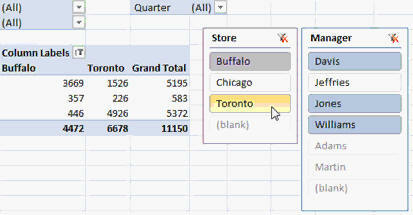 You'll see how to create Slicers (a new feature in Excel 2010). You'll create Slicers for multiple values, and see how to select multiple items per Slicer. Next we'll focus on PivotTable layout and design. You'll see how to show/hide subtotals and grand totals. You will see options for adding blank rows after groups of data, row and column headers, banded rows/columns, and PivotTable styles. 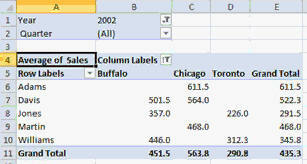 You'll also learn a neat trick for creating a separate sheet showing a subset of your PivotTable data. You will next learn how to create PivotCharts, which are essentially PivotTables in chart format. You'll learn many different formatting and layout options for PivotCharts, and how to move them to a separate sheet for easy printing. Again, this is the perfect class for anyone who wants to learn how to work effectively with PivotTables and PivotCharts in Microsoft Excel 2010. Of course, if you have any questions about whether or not this class is for you, please contact me. Richard on 6/14/2011: The focus of this course is working with PivotTables and PivotCharts in Excel. Topics covered include: - What is a PivotTable? Why use them? - Creating a PivotTable - Set Values, Row & Column Labels - Editing a PivotTable - Sort, Filter, Expand, Collapse, Pivot Data - PivotTable Layout, Slicers, Multiple Values - Subtotals, Styles, Data Subsets - Creating & Editing PivotCharts - Grouping Data by Month, Value Ranges - Lots More! I wonder why i have been afraid to use Pivot tables. You make it look so simple. Thank you for developing this tutorial! The slicer is really a cool feature. Wow! Why does the vedio player not show a vedio? It just shows a picture. There's nothing wrong with the video. Try switching to the FLASH player (option in the bottom left corner). Terry Stevens on 11/11/2011: Excellent Tutorial! Becky Young on 1/13/2012: Do you have self tests for the different levels? I have tests for SOME of the classes, but we haven't made any new ones in quite some time... it's one of the things on my TO DO list for 2012. Try downloading the course again. This usually happens if a video didn't completely download 100% successfully. If that doesn't work, try watching the course in the Theater online. steve jordan on 12/15/2012: hello, can you install a search option for your lessons. i am looking for the lesson that shows how to do sticky notes.i have bought alot of lessons but find it difficult to remember in which lessons certain tips are found. a search would help me locate itmes i need rather than trying to hunt through all the lessons i bought trying to find some small item. Yep. See that SEARCH BOX in the upper-right corner of every page on my site? You can use that to search for lesson topics. You do have to know what you're searching for, however. In this case, you're looking for COMMENTS. You can also drop down that "MORE..." box and go straight to the full outline for all of my Excel class topics. You can use CTRL-F in your browser to search once you're on that page. Jennifer Hull on 4/1/2013: Hi Am using access. I need to look at data with a 3rd dimension. 2. 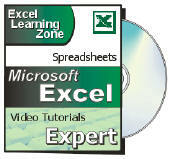 Can you use a pivot table as part of access. I need to look at 15 fields ( blood results) for each week,for each patient over a 25 week period. 2. PivotTables have been DISCONTINUED in Access 2013. I never liked using them in Access anyway. They were always much better in Excel. If you explain to me more about what you're trying to do, perhaps I could help you come up with a better solution. 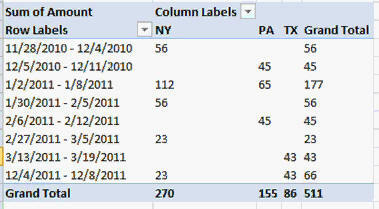 Laurie J. on 5/2/2013: Is it possible to create a workbook that includes several PivotTables on their own sheet that calculate different data? I would like to create a workbook where I can plug in the data and have the information automatically populate. Thank you. Sure. When creating the PivotTable you can choose to insert it in a new sheet or in a location in an existing sheet. 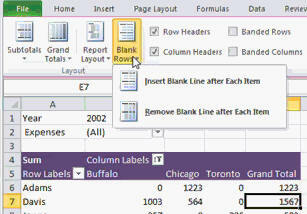 You can in Excel 2013. I'm pretty sure you can in 2010 as well. For Pivot Tables, in the Options Menu's Totals & Filters Tab, what does "Allow multiple filters per field" mean? Wouldn't 1 be enough? Glad to hear you're well prepared, good luck and hope it goes well. Rajiv Dass on 11/25/2015: When you select "Multiple Items" within Managers (07:37), how do see the Managers Name correlating with their sums? Eghosa Obazee on 3/30/2016: When are we expecting a more Advanced form of Pivot Table dealing with Calculated field, column amd other Pivot Table application to Financial Analysis.